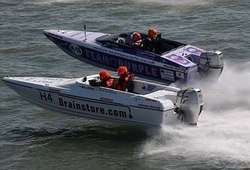 If you like it wet, wild and wickedly fast, a Powerboat grand prix from StagWeekends will definitely rev up your motor. Rock the boat, yea rock the boat baby, smash the waves and kick up some crazy spray because these are no boy’s toys, this is motorsport for the real men. These high adrenaline, high value speed machines used to be reserved for the rich and famous but this is your chance to show off and straddle the surf like an Arab prince who just got his inheritance. Get kitted out with safety gear and a briefing and after a few lessons in how not to sink it’s your turn to take hold of the throttle and rip up the tide. Once you’ve had your fill of that pulse racing power you can head back to dry land and kick back at the beachside bar, knock back a few pints and find out who's king of the waves and who bottled it after the first buoy. 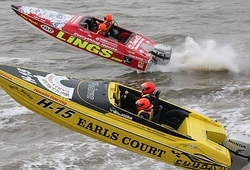 Take your stag do off the deep end with a Powerboat grand prix from StagWeekends, it’s the wettest fun you can have without changing the bedsheets.